In the spring of 1946, ex-corporal Sam Richardson returns home from the "forgotten war" in Burma to his hometown of Wigton in Cumbria, England, to the joyful relief of his young wife, Ellen. He finds a town in which, seemingly, little has changed: the same twisting alleys, weavers' cottages, and medieval archways and the same lack of prospects for an uneducated, working-class man like himself. Sam, however, has changed. The war has not only left him with traumatic memories, which he tries to suppress, but also given him greater self-confidence and broadened his horizons. From her wartime jobs, Ellen too has gained a sense of independence she does not want to give up. And then there's six-year-old Joe, a baby when Sam volunteered, who can scarcely remember his father. As all three strive to adjust, the bonds of love and loyalty become stretched to the breaking point. 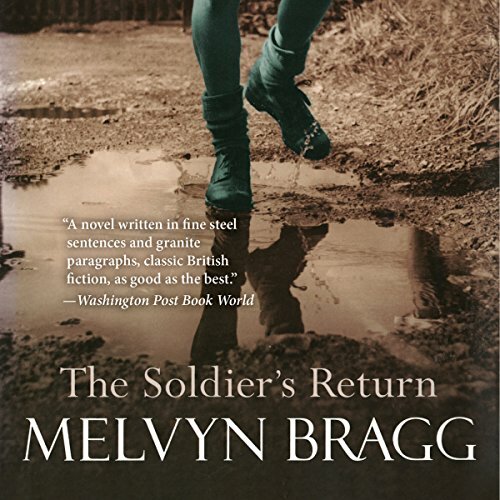 With this absorbing story of one family, Melvyn Bragg conveys the experience of millions in the aftermath of the Second World War. The Soldier's Return is a taut, profoundly moving novel by a writer at the height of his powers. ©1999, 2011 Melvyn Bragg (P)2015 Audible, Inc.